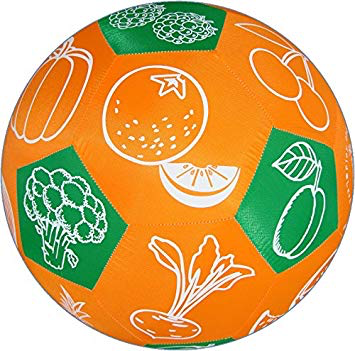 Fruit & Vegetable – Many games can be enjoyed with the Fruit & Vegetable ball. Calling out names, whether it is a fruit or vegetable, how does it grow / fruit? Plus, other activities, such as where does it originate? Describe it, taste, smell, feel. Ideal for foreign language studies, training, or fun activity to engage group spontaneity. Great party ball too! Learning through playing. It is well known that the brain works best when it “runs on fun”. Studies have shown that the games and physical activities play a crucial role in children’s physical and social development. 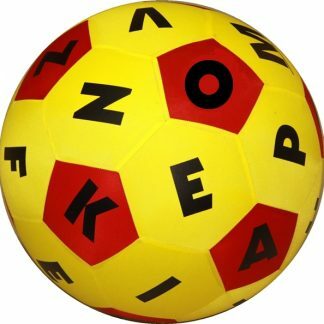 Hands on Play and Learn Balls are the ideal link between cognitive development and physical exercise. 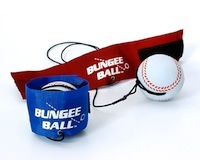 Lightweight and very robust, HANDS ON Play and Learn Balls are ideal for toss and catch games. The HANDS ON inflatable Play and Learn ball consists of a stitched 32-panel fabric cover and heavy-duty balloon. The game rule is simple: Two or more players throw the ball to each other, answering the questions their right thumb lands on.